We often think of such a question as asking “Is this true? Is it real? Can we believe in it?” When looked at in this way, Mary’s question is attempting to tie the facts she knows together with her faith. How can this be? Let’s see, suppose I wrote a letter to the city hall in Bethlehem. And in response to my request, a clerk digs around in the old dusty records in the basement. Suppose that clerk finds what I’m looking for and sends me a copy. 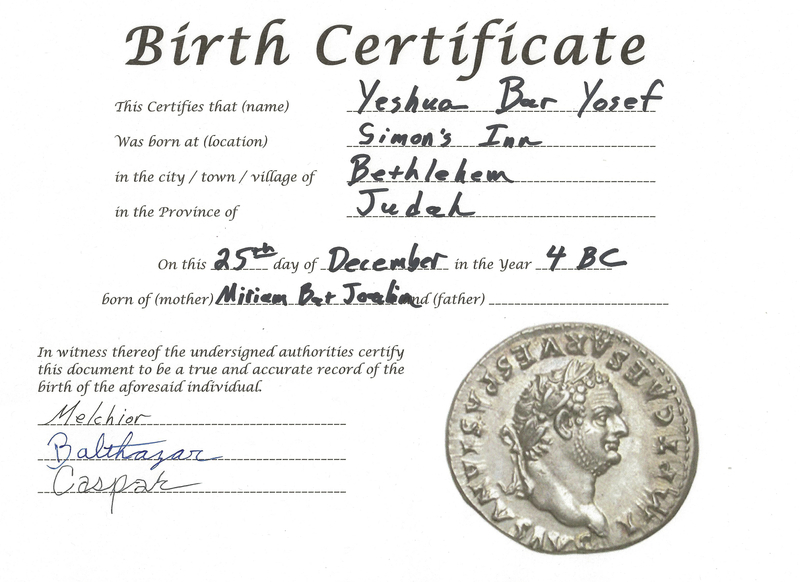 A Birth Certificate, like this one – let’s see – ah… dated the 25th of December 4 BC (How’d they know it was 4 BC? ), and the baby’s name is Yeshua. Ah, the mother is Mariam. (Hmmmm the father’s name is blank…) Oh, and – look here – some of the witnesses signed it, too … uh … Melchior, Balthazar, and Caspar. …Wow, it would be amazing if we had such proof of Christ’s birth, wouldn’t it? But, such a piece of paper, by itself, is meaningless. Yes, it would be real, a fact, but its reality comes alive and has meaning for us only because we see it through our faith. Such a document would only tie together a lot of things we already know, and believe. If we can’t read Aramaic, or Greek, or whatever language it was written in, we wouldn’t even know what it said. If we know nothing of Christianity, what is written on it would be totally irrelevant to us. Without faith, the facts in such a document, in isolation, independent of all the connections it creates in our minds and spirits, lose their reality. They lose the vibrancy and intensity they might otherwise evoke in us. No person of faith, of any faith, bases his or her belief on one piece of paper. There’s a lot more to it. The facts in such a document would be of value only when seen through our faith. Only through faith would it become reality. Likewise, faith that is not grounded in reality has no value. If our faith doesn’t connect with, and strengthen, what we already know is real and important, then it is of no benefit to us. Such a faith cannot live, and will not survive. This is why James, in his epistle, says “Faith without works is dead.” His point is that Faith and Reality are inextricably tied together. We see our faith through our own reality, supported by the facts we know; and we also see the reality in front of us through our faith. Like that Birth Certificate illustrated, the Virgin birth is a fact for us because of our faith. It has a reality, a fullness, because our faith is alive, always growing and deepening as we continue our journey towards greater understanding of the eternal and unchanging truth that is in God. Now, let’s go back to look Mary’s question from a different angle, and see where it leads. What does virginity have to do with it? Mary is about to get married! That she will soon lose her virginity, maybe even get pregnant, is no surprise to anyone! 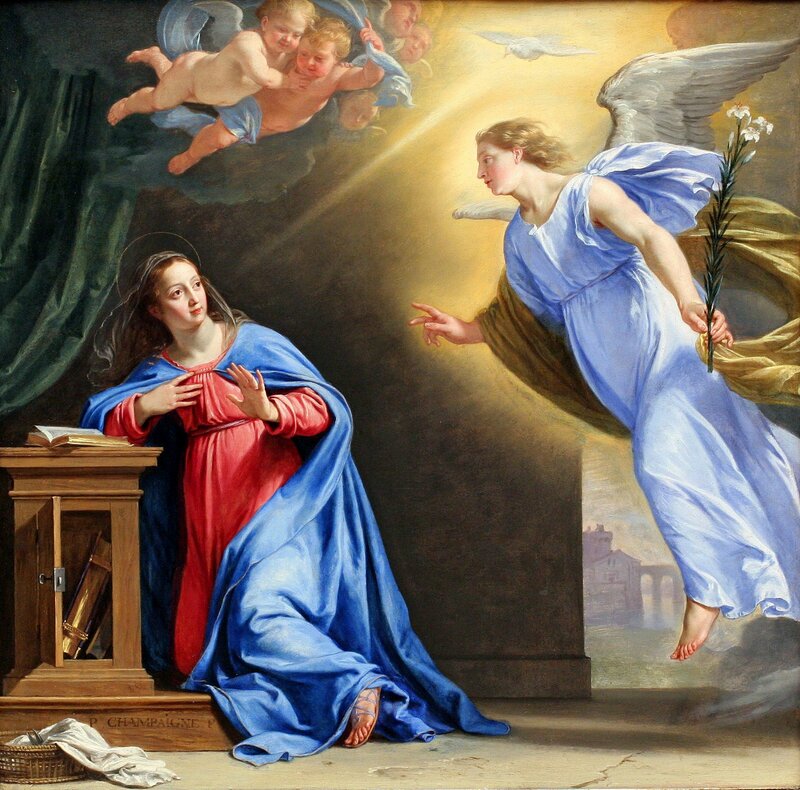 Our common conception, that Mary is asking how a virgin can have a child doesn’t make sense; because, at this point in the story, all that Gabriel has said is that the child to come will be given the throne of his ancestor, David. There is no mention yet of a virgin birth! And, Mary already knows that her future husband Joseph is a descendant of David. So, if anything, it seems to Mary that Gabriel is simply confirming that Joseph will be the father. Also, the language Gabriel uses here is nearly identical to what we see elsewhere in the Bible, when couples who are desperate for a child, like Sarah and Abraham, are told by an angelic messenger that their prayers have been answered. No difference, nothing new! We need to bear in mind that Mary isn’t looking for help. The angel does not come in response to prayer. God is not responding to some known lack in Mary’s life. Mary is still young, her future is filled with the possibilities and energy of youth. She’s anticipating marriage, children, perhaps even imagining what her grandchildren will be like. All these other couples in scripture could not have children. They were all desperate, because in that time and place, being childless meant you had no future. This is not Mary’s situation, Mary still has a future. So, from her point of view, when she says “I am a virgin,” she is simply stating the facts – she is still a young woman with all of her future and the possibilities it contains, open to her. The disappointments and challenges of life have not yet closed any doors. So, she does not understand the purpose of this divine intervention in her life, nor what is so special about this birth, other than her child shall be a King. God is doing something different here, something new is happening, and Mary sees the difference. But, she does not understand how this can be, or why. She’s perplexed. Until this moment, Mary‘s expectations were just like those of any other young woman in her time and place. Until this moment, she had anticipated her future as being similar to that of everyone else she knew, there in her little village, in that anonymous corner of the world. And yet, the angel came to her. And so, this brings us back to my questions at the start of this meditation: How can this be? Why is this? What does it mean for us? For me, it’s the very ordinariness of Mary that is at the heart of this. God calls her out of an ordinary life. God asks her to do something that has never been done before. She has to be willing, even though she is unsure what her response will bring. She fears the rejection, challenges, condemnation, perhaps even punishment she’ll face for being an unwed mother. Although it is clear her son will be destined for greatness, she doesn’t know the details of God’s plan for the child; nor what it will mean for her. Yet, she is willing: she knows God can do all things, and so she responds to this call into the unknown, placing her life in God’s hands. For me, this is the heart of the Annunciation. God isn’t here just in the extraordinary times. God isn’t here just when we need divine providence. God loves us, and calls us, right here, right now, right where we’re at in our ordinary, everyday lives. And now, let’s circle back to my earlier thoughts on Faith and Fact: We’ve learned that Faith and Fact cannot exist in isolation from each other. Reality impacts how we understand our faith, and our faith helps us to see and comprehend the reality all around us. But how can God, the one perfect, omnipotent, omnipresent and eternal God, become a reality to us? And, how can we become a reality to God? How can such a god have any sort of relationship with us, as we wallow here in our finite and corrupt humanity? There is no point of connection, unless God somehow becomes part of our reality, unless, somehow, the infinite God, our only God, who can do all things, becomes present and real for us. The answer, the gospels tell us, is for God to become one of us. This is the lesson, and this is why I know, and have faith, that Mary’s encounter with God is real, because through her it became possible to enter into relationship with God in a new and deeper way. And, through her we learn that faith and reality are inextricably bound together. In Mary we find that nothing limits what God can do, not even the ordinariness that we all, including God, share with her.